Why do you need a furnace filter? Furnace filters are the main source of protection for the furnace. Furnace filters also clean the air that you are breathing in. Depending on the type of the filter, it can remove lint, pollen, mold spores, animal dander, and possibly even smoke and particles that carry viruses from the air circulating around your house. The two most common types of furnace filters are the mesh filters and the pleated filters. The mesh filters are typically used in the wintertime, and last about 30 days. The other main type of furnace filter is a pleated filter. This type of filter lasts for about 2-3 months, and is used in the summertime. First of all, there are many several different factors that affect the life of your filter. A few of these reasons include: owning house pets, tobacco smoke in the air, and remodeling the home. Because of these factors, you should check your filter occasionally to ensure maximum efficiency. Not a handy man? No worries! 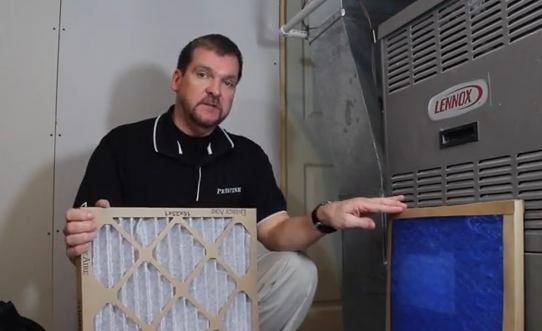 Changing the filter on your furnace is really easy. Before inserting the new furnace filter, you want to make sure to take the old filter out first and discard it. The two types of filters listed above both come with a cardboard frame. On this frame, there will be arrows pointing in a certain direction. Once you have the arrows pointing towards the furnace, it should slip right into place. The arrows are meant to point in the direction of the airflow.